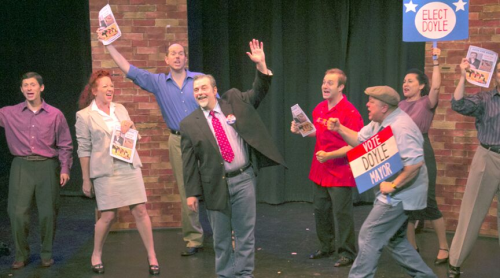 EDDIE AND THE PALACEADES SAVE THE PALACE is an all original musical comedy. The Palaceades have been playing music together since they were teenagers. Thirty years ago, in their 20s, they opened for the Beatles and were on the cusp of fame and fortune but gave it up to raise their kids. They are senior citizens now, empty-nesters, approaching their 60s and facing a brand new set of "coming of age" challenges. The Palace Theater, where they got their start and the name for their band, is threatened with demolition and The Palaceades have come out of retirement to play a fund-raising concert. When this "let's put on a show" effort fails, our hero Eddie steps up to fight the pay to play politics of the 90s and runs for mayor to save the Palace Theater. Thrilled by the applause at the Palace, his wife Gracie would prefer to reboot their musical career and go back on tour. It’s a roller coaster ride of emotional moments with endearing songs to make you sing and dance, and a crew of corrupt politicians who will make you laugh till you cry. "I WAS COMPLETELY DRAWN IN. EDDIE AND THE PALACEADES WILL PLAY AGAIN AND AGAIN AND AGAIN." "UNQUESTIONABLY TWO HOURS OF PURE ENJOYMENT"
"THE SHOW HITS THE RIGHT NOTES WHEN IT COMES TO ITS HEARTFELT EXPRESSION OF LOVE, FRIENDSHIP AND THE THINGS WORTH FIGHTING FOR." "THE MUSIC IS TERRIFIC. SOLID, CATCHY TUNES, GOOD LYRICAL HOOKS, GOOD MUSICAL HOOKS. THE EARWORM-WORTHY MUSIC WILL CARRY YOU A LONG WAY." "I LIKED THE MUSIC VERY MUCH." "I FOUND MY EYES WELLED UP WITH TEARS FROM THE HEART-TOUCHING SONG I MISS MY WIFE." "CATCHY TUNES LIKE MEET ME AT THE PALACE, WRITE ABOUT THAT, AND C'MON EDDIE YOU CAN DO IT GET THE CROWD CLAPPING, CHUCKLING, AND NODDING THEIR HEADS." " WRITE ABOUT THAT - A REALLY FUN SONG. INJUNCTION -FUN EXCITING NUMBER. BANGARANG - ANOTHER GREAT GROOVE, SOUNDS CONVINCINGLY LIKE SOMETHING THAT WOULD HAVE BEEN A HIT. PAY TO PLAY - THIS IS A REAL MUSICAL THEATER SONG, WORKS GREAT."